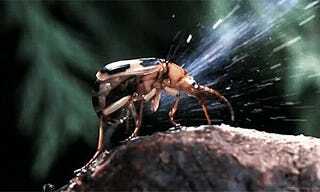 The always cool biomorphosis.tumblr.com posted these slow-motion animated gifs in which you can see one of the most efficient defensive chemical weapon in nature: the cannon of the bombardier beetle, which shoots "a boiling hot mixture of caustic chemicals reaching 212° F (100° C)." Bombardier Beetle when threatened, sprays the attacker with a boiling hot mixture of caustic chemicals reaching 212° F (100° C). 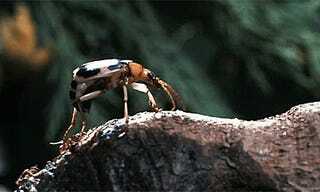 Even more impressive, the bombardier beetle can aim the poisonous eruption in the direction of the harasser. The beetle itself is not harmed by the fiery chemical reaction. Using two special chambers inside the abdomen, the bombardier beetle mixes potent chemicals and uses an enzymatic trigger to heat and release them. The foul concoction does burn and stain the skin. This defense proves effective against everything from hungry spiders to curious humans.